Marina Denisenko never ceases to amaze fans of lacquer art. There is a great sense of power in her works, and although she works with egg-tempera paints she is able to use them like oil paints. 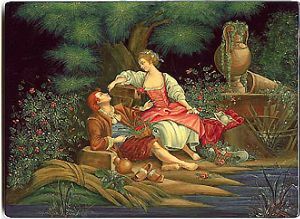 Reminiscent of many 19th century French paintings, this work depicts a couple that has to try and be together. They hide from family and friends. Somebody doesn't want them to be together. Here, they are concealed by the beauty of the surroundings. The Palekh tradition of a black background, not indicative of the time of day, brings out the colors within Denisenko's palette tenfold. The structure and color of the plant life is a wonderful example of the artist's ability. Olive, apple, sea and yellow green make up the majority of the plants or leaves. These colors are highly realistic. The artist takes great care in the planning of the shapes. Each leaf appears unique. Hand painted art work like this is very difficult to produce. The leaves and grass have a three dimensional nature about them. This is especially true when observing the rose bushes just behind the gentleman's right shoulder. Scent is almost a possibility. Where intricacy is used in the foliage, an assortment of smoothly swift brushstrokes are used to shape the realistic folds and shadows within the character's clothing. The wrinkles in his pants and the ruffles in her dress are expertly achieved. The fountain is also elaborately painted, it gives an additional authentic elegance to the whole composition. Denisenko uses gold contours to enliven many of the subjects within the composition. The greatest evidence of this can be found in the leaves within the background tree and in the leaves of the rose bushes. The texture radiates a noble glimmer of gold. The artist has created a glorious garden of heavenly beauty. The clothing of the characters is only slightly highlighted in this way. The box is made out of paper-mache made in Palekh. Black lacquer covers the exterior and red lacquer covers the interior of the box. Gold swirling line decorates the edges of the lid and the sides of the box. All four sides of the box are also decorated with the beautiful gold ornamentation featuring the rose bush covered with big blossoms. A hinge has been fastened to the top of the composition, and the box rests on a flat bottom. The artist has signed her name, the year of 2002 and the village name of Palekh along the bottom of the composition in gold paint.